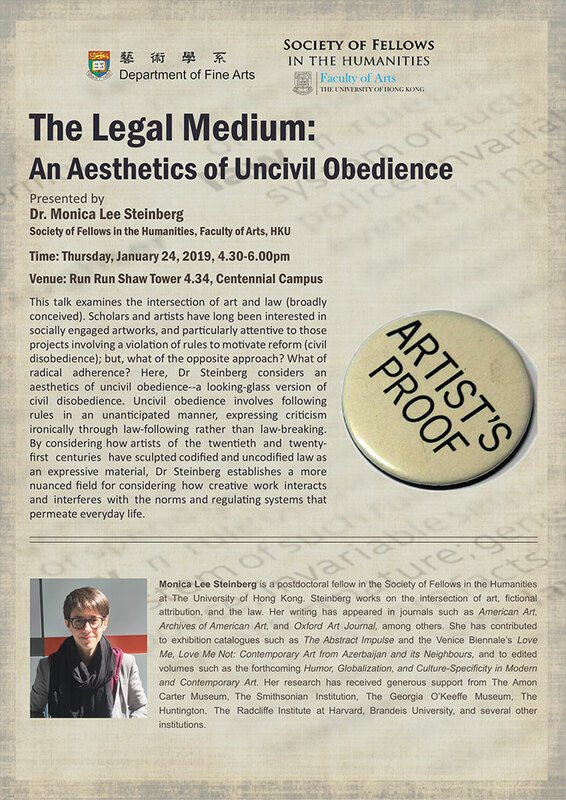 artists of the twentieth and twenty-first centuries have sculpted codified and uncodified law as an expressive material, Dr Steinberg establishes a more nuanced field for considering how creative work interacts and interferes with the norms and regulating systems that permeate everyday life. Monica Lee Steinberg is a postdoctoral fellow in the Society of Fellows in the Humanities at The University of Hong Kong. Steinberg works on the intersection of art, fictional attribution, and the law. Her writing has appeared in journals such as American Art, Archives of American Art, and Oxford Art Journal, among others. She has contributed lo exhibition catalogues such as The Abstract Impulse and the Venice Biennale’s Love Me, Love Me Not: Contemporary Art from Azerbaijan and its Neighbours, and to edited volumes such as the forthcoming Humor, Globalization, and Culture-Specificity in Modem and Contemporary Art. Her research has received generous support from The Amon Carter Museum. The Smithsonian Institution, The Georgia O’Keeffe Museum, The Huntington, The Radcliffe Institute at Harvard, Brandeis University, and several other institutions. Copyright © School of Humanities, The University of Hong Kong. All Rights Reserved.